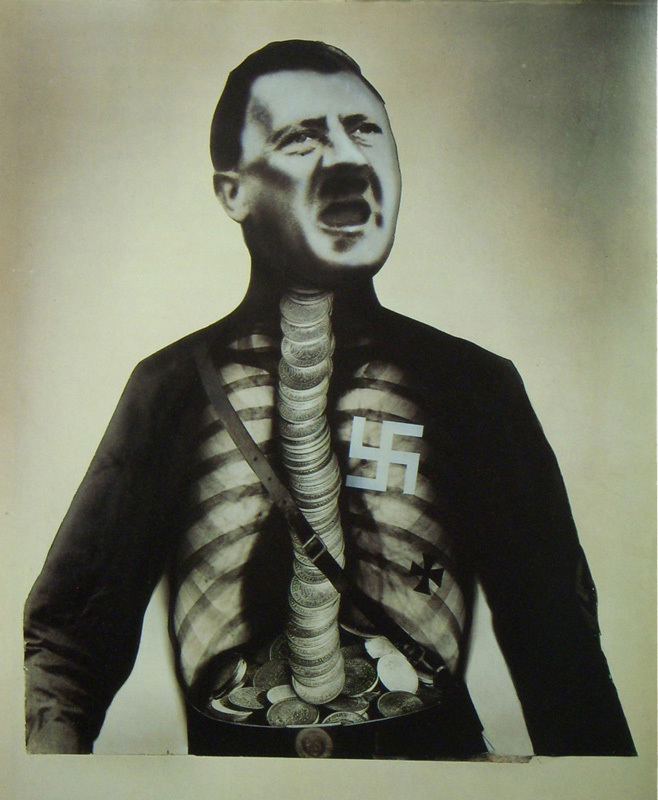 Heartfield’s famous antiwar poster of Adolf Hitler with his chest and belly full of gold from his financial supporters is one of the artist’s most famous images. Heartfield instantly makes it clear that the Führer can perform a miracle of political alchemy. Hitler, like so many politicians throughout history, converts financial contributions from war investors into nonsense to stir up the people and push the nation towards war. This montage of Hitler was originally an AIZ Magazine Cover. It appeared on street corners all over Berlin in 1932. It was a count, a member of the German nobility, who saw the need for this montage to be reproduced as a poster to be distributed throughout a Berlin to expose the true goals of The Nazi Party.